Brookside Fire Service supply British designed fire extinguishers to the latest standard BSEN 3, complete with kite mark, CE mark and a 5 year guarantee. There are no hidden costs and all fire extinguishers are commissioned on site by our qualified engineers. 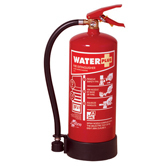 Water extinguishers are used for class A fires. They cannot be used in a gaseous or flammable situation, where ignition is the key to the combustion. Suitable for class A type fires involving combustible materials such as wood, paper and fabrics. This extinguisher gives up to 150% more firefighting capability than conventional water and is 30% lighter. 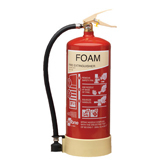 AFFF ExtinguisherFoam extinguishers are not effective against running fires, but are effective against contained fires, providing protection for class A and B fires. Wet Chemical extinguishers are designed to extinguish fires that could reach 500 degrees centigrade, such as class F cooking oil fires. It is also effective on class A fires involving freely burning materials, such as paper and wood. 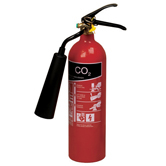 The CO2 extinguisher is effective on class B and electrical fires and is recognised for its non damaging high performance and non conductivity. It may be ineffective on class A fires as it may not displace enough oxygen to extinguish it. 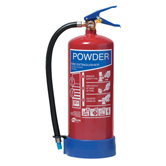 Powder extinguishers are extremely effective at putting out class A, B, C and D* fires. They can, however, mask out an escape route and damage surrounding equipment. *class D (flammable metals) fires can be extinguished using specialist dry powder. 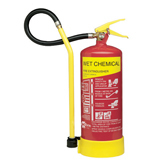 If a fire extinguisher is purchased from a web site it will probably be delivered by courier in a van. It would not be possible to ‘commission’ it before it is sent out as it could be damaged, discharged or have lost pressure en-route.